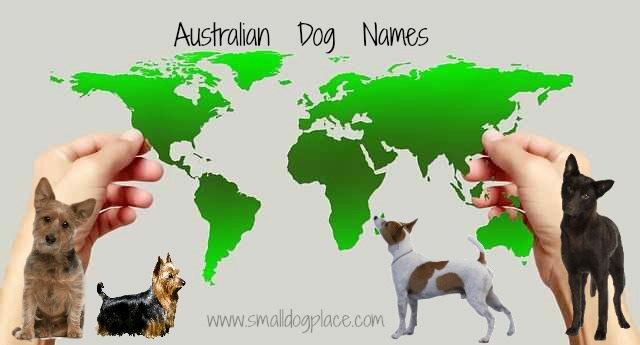 Australian Dog Names are perfect for you little Silky or Aussie Terrier, but even if you don’t have a dog native to Australia, there're many reasons why choosing an Aussie name might make sense. Maybe the unusual animal life has you intrigued or perhaps you dream of a vacation complete with visiting the Great Barrier Reef o the vast outback. From the Australian Cattle dog to the Tenterfield Terrier, Australia has many different dog breeds to offer the world and also is the origin of many of our current favorite small dog breeds including the Silky Terrier and the Australian Terrier. Many of the dog breeds that originate in Australia are very protective, cautious, and loyal dogs, due to their natural ‘guard dog’ instinct. As you can see from the list below, many Australian Dog breeds are larger than what you would typically see on Small Dog Place. They were developed in the 1800's to help control cattle over long distances in rough terrain in hot climates. Many of the dogs in Europe used for the same purposes just didn’t work as well in Australia. The Australian Cattle Dog, the Australian Kelpie, and the Australian Stumpy Tail Cattle Dog, Koolie, and the Halls Heeler are examples of Australian made dogs that were created for the rugged farm and ranch life. Other breeds such as the Tenterfield Terrier was made in Australia by employing other small European terriers that were known as good ratters. But, contrary to what the name implies, the Australian Shepherd was actually created in the United States. Many of the breeds listed below are not registered with the Australian National Kennel Council or other clubs but are widely known in Australia. Croc – short for crocodile, a reptile found in abundance in Australia. Kangaroo or Roo – the symbol of the country. Kookaburra – a bird native to Australia and New Guinea.